Across the country, fireworks will begin this weekend to celebrate Independence Day. There is bound to be a dazzling array of colors, patterns, and sounds in the night skies somewhere near you! Since their invention in the early 7th century in China, many people have enjoyed watching fireworks for all kinds of special occasions. However, few people know how they work. According to Scitable, “fireworks can be broken down into three primary components: colored light, noise, and smoke. Designing a successful display requires arranging all three effects in ways that complement each other and leave the audience awed.” Believe it or not, all of those are grounded in science and improved over the centuries by technology. Going from ground level and hand-lit, fireworks are now executed with computers to enhance their precision and safety. Research on the chemicals, the implementation of microchips, and better materials have also contributed to more mesmerizing shows. Where does the color in fireworks come from? 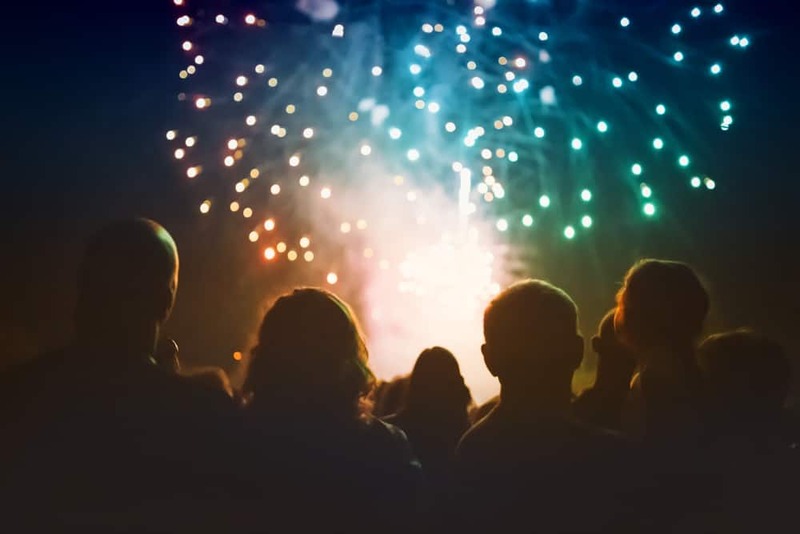 Fireworks emit such vivid color because of how elements behave when they are heated. Choosing the right elements for a desired color is a difficult task because of the how photon emission works. Once you’ve picked the right elements to produce your favorite colors, you need to think about how you will use them in an actual firework. In some cases, the element itself can be packed inside a firework. Titanium powder can be used like this, but it is a rare example. Sodium produces an intense yellow, but if it comes in contact with water it reacts violently. Strontium produces a vivid red, but will burn in air. Next, these element will need to be kept as salts for safety purposes. Then, do a little research as to which salts will react with other compounds to produce the desired fireworks results. For example, to produce yellow and white light, use aluminum power to produce the white and a sodium salt to produce the yellow. 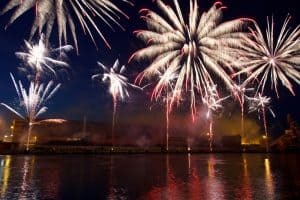 How are fireworks launched into the sky? Finally, black powder (a mixture of sulfur, potassium nitrate, and charcoal) is needed to launch the fireworks. And, once they’re launched, there are all kinds of possible results! According to PBS.org, there is the chrysanthemum, willow, diadem, palm, crossette, horsetail, ring, and peony, to name a few. Chemists are constantly looking for bigger and better. For example, how about day time fireworks? However, for the time being, most are just after a more stable blue. The Smithsonian reports that colors like red, green and orange are easy to produce. “The copper compound used to produce blues, however, is finicky, and destroys the color if temperatures get too hot.” Finding a more precise way to control temperature is the key and the answer is out there somewhere. In the meantime, here’s to staying cool, more blue, and a very Happy 4th of July!